Defense ruled the 2018 Triple J High School All Star Football game Saturday night at Angels Field in Dededo. After both teams failed to score in the opening quarter, the Mustangs escaped with a 19-14 victory at the end of regulation over the Raptors. Both team defenses recorded a touchdown in a game that saw both offenses struggle until late in the contest. 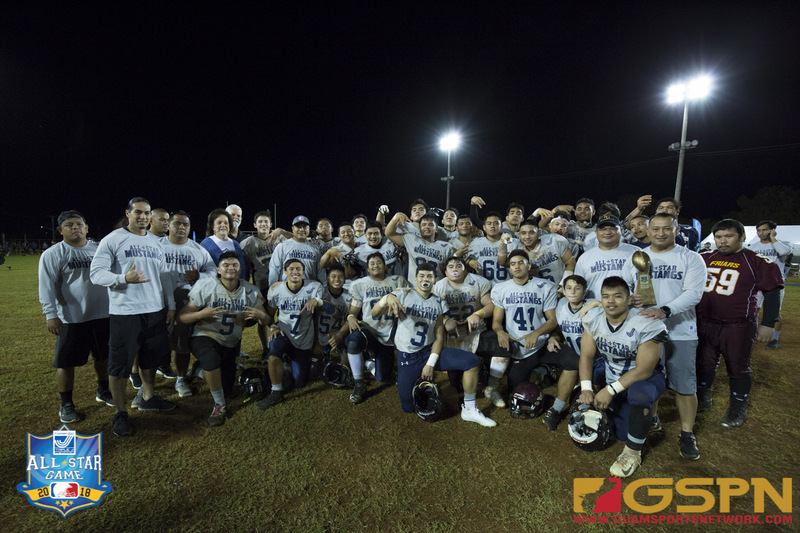 The 4th annual event sponsored by Triple J was coached by IIAAG championship game team coaches Bruce Meno (Mustangs) from FD and Ryan Rios (Raptors) from GW. Josh Dela Cruz (GW) from the Raptors was the first to make a big play with a blocked punt. Dela Cruz blocked a punt attempt by Mustang punter Noah Diaz (FD); picked up the ball at the 14-yard line and dashed into the end zone for a touchdown. After a failed two-point conversion, the Raptors led 6-0. “I faked the blocker by going outside and went inside instead for the block. When I saw the ball, I wanted the touchdown,” said Dela Cruz. Dela Cruz picked up the football and avoided dragged a couple of Mustang players with him into the end zone. At halftime, the score was 6-0 and both defenses were locking down the opposing offenses with two forced fumbles and two interceptions by the break. A big play by an MVP on offense was badly needed and Mustang running back Kein Artero (Fd) stepped into the spotlight. Artero was not finished, giving the Mustangs a 12-6 lead with a 90-yard touchdown in the fourth quarter. Artero found a hole and followed his blockers as he dashed down the left sidelines for the touchdown. The Raptors looked to counter with running back Deante Delgado (JFK) rushing for a huge 45-yard gain to put Rios’ squad into the red zone. With the Raptors threatening, the Mustangs get a huge play from Gabe Stanley (Southern). Stanley stripped fullback Chase Spotanski (JFK) from the Raptors and returned the strip for an 85-yard touchdown. “After I got the strip, I honestly thought that someone was going to tackle me but I ended up scoring a touchdown. I heard footsteps behind me but I just kept running,” said Stanley. The Raptors had a little under three minutes left and needed two touchdowns to win the game. Quarterback Travon Jacobs (Guam High) found receiver Nico Velez (JFK) for a 35-yard touchdown to cut the deficit to 19-14 after a successful 2-point conversion. The Raptors needed an onside kick and John Topasna (Southern) executed the kick perfectly to regain possession. The Raptors had under a minute remaining and 55 yards to a victory. They quickly got a first down and looked for a big gain but Stanley played spoiler with a game ending interception to give victory to the Mustangs. “I was happy to see my (Southern) teammates playing on the other team do so well; I’m always going to root for my boys,” said Stanley. Stanley watched proudly from the opposite sideline as his teammate Topasna, playing for the Raptors, executed a perfect onside kick to extend the game. “But then again the other side of me was like ‘man, why’d you have to do that’,” joked Stanley. All players and coaches huddled at midfield after the game and took pictures. Some were seniors and it was their final game, others used the experience to learn for next season. “It was truly an honor to play in this game,” said freshman linebacker Evan Brown (FD). “It was very competitive and a different level when everyone is an all star. Our goal was to have fun and I think we accomplished that,” said Brown. Brown played for the Mustangs. Mustang defensive end Lawrence Tisalona (JFK) had a good all around game with a pair of batted down passes and a couple of tackles for losses. “This is one the best games I’ve played all year. I had fun and I executed out there,” said Tislona. “I also got to tackle my JFK teammates Deante (Delgado) and Chase (Spotanski),” said Tisalona with a smirk. Ethan Cepeda (FD) from the Raptors had an interception in the first half. Most of Cepeda’s teammates from FD play for the Mustangs but he said he learned from coach Ryan Rios and enjoyed the practice time with Raptor teammates. “I learned to have fun for this game. The whole season was so serious and coach Rios told all of us to have fun and enjoy the game,” said Cepeda. Jayson Jackson (Guam High) played for the Mustangs and he also recorded an interception. His pick was courtesy of regular season teammate Travon Jacobs.